Includes a set from each of the listed years except 1963, 1966, and 1967. Envelope corners show some wear. Description: Includes a set from each of the listed years except 1963, 1966, and 1967. 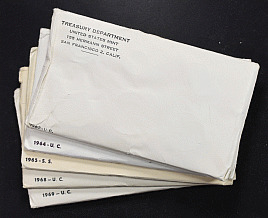 Envelope corners show some wear.